KIEV ATTACKS. On Tuesday what remains of Kiev’s army, accompanied with threats of destruction, entered two eastern cities, Kramatorsk and Slavyansk. 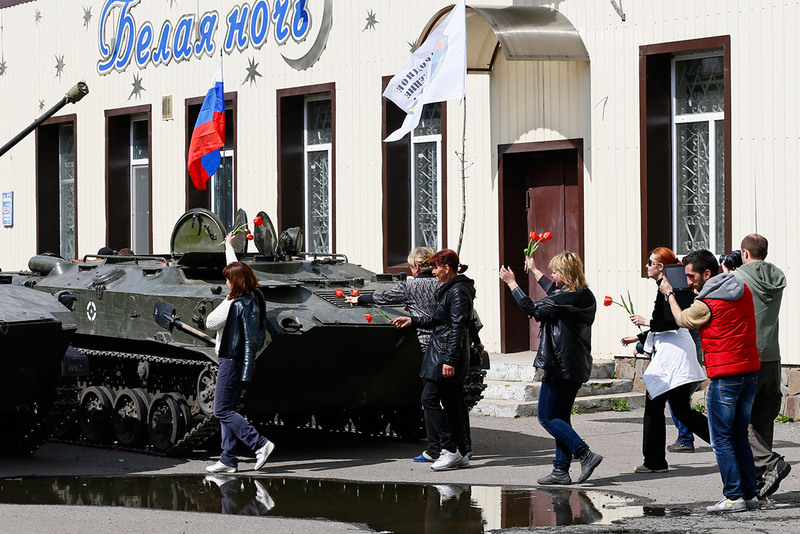 The soldiers soon switched sides (or as they say in Kiev “Russian terrorist sabotage groups have been captured six units of armored vehicles”), up went the Russian flags and St George ribbons and the townspeople fed them; I guess the American rations didn’t get to them. Interview. And another column stopped. Good news – especially when you think of what the rhetoric of easterners as “terrorists” and Washington’s enthusiastic encouragement could have led to. Today will probably tell: if the attacks fizzle out, there’s still hope for a federalised Ukraine. I look forward to watching Washington, Brussels (and Ottawa, I am ashamed to include) try and spin their way out of this shattering confutation of their fantasies. Reminds me of the Ossetia War when Wikileaks revealed that the US Embassy had uncritically transmitted whatever nonsense it was being fed by the Saakashvili regime. TIME TO GO? Staff in Kiev’s power ministries are changing sides, refusing to attack the protesters, melting away; there are more dismissals in the power organs. Kiev’s new rulers have, apart from the uncertain loyalty of the most extreme, little force available (vide Kramatorsk). Moody’s has dropped Ukraine to “default imminent with little prospect for recovery”. Their sponsors in Brussels and Washington have kicked in only a sum that would about cover what China is suing Ukraine for. Meanwhile conditions worsen for the ordinary stiff. Large areas of the east ignore Kiev and demand more autonomy or a referendum. And where’s Right Sector? Disarmed? Mobilising? Or beating up presidential candidates and demanding resignations in Kiev? Can’t think Yatsenyuk will be around for much longer: no power, no money, no support. A visit from the CIA head isn’t much comfort. SNIPERS. It’s almost forgotten now, but the Ukraine crisis was negotiated to a satisfactory result on 21 February. The agreement collapsed thanks to the snipers on the Maidan. So who were they? The new people in Kiev, predictably, blame Yanukovych and hint at Russian involvement. However, the simple application of the principle of cui bono would query that. The Ashton-Paet intercept raised the possibility that the snipers were connected with the people now in power in Kiev. A German investigation supports this conclusion. This question is at the core of the nature of the regime now in Kiev and, Dear Reader, its coverage, or ignoring, will be another test of whether your local media outlet is reporting or re-typing. Original in German, English translation on JRL/2014/84/1or here. SNIPPETS. Far extreme anti Russia propaganda (but note what Tymoshenko said and how The Telegraph chose to frame the story.) Note this photo of Kiev’s Interior Minister; what’s the story on the flag patch on his guard’s uniform? You may be sure that people in south and east wonder. Here are some easterners stopping a lone tank. The “Russian colonel” video is a fake. These are former Ukrainian vehicles that switched sides. SANCTIONS. Remember how Russia’s stock market was going to be badly hurt by the sanctions? Not so much. AND EVEN BIGGER CONSEQUENCES? The “petro-dollar” is a pillar of US power. There are straws in the wind: the BRICS talking about setting up their own IMF. Russia, China and India thinking about by-passing the US Dollar in oil deals. Et Cetera. I wonder if the fall in the US stock market has anything to do with this. After all, Washington does not look like a good bet at the moment: hugely overextended, empty blustering, incompetent and destabilising interference. Time to bring it down? Or time to get yourself out from under the crash? RUSSIAN MASSING. Finally NATO issued some pictures of the Russian forces “massing” along the border. Nonsense! all clearly bases: everything neatly lined up, fences around the edges, buildings, no tactical grouping. Not evidence at all. In some cases you can find same or similar photos on Google Earth from months ago; the airfield at Primorsko-Akhtarsk for example; same aircraft in different places. Holly finds no Russians. PUTIN LETTER. Trying to inject some reality, Putin sent a letter to Russia’s European gas customers. It says: Ukraine’s economy is collapsing; Russia has been providing cheap gas, other money and discounts totalling about US$35 billion in the last 4 years; the EU has contributed nothing; Ukraine hasn’t paid anything for gas for several months. Russia is close to demanding payment in advance for deliveries; this “increases the risk of siphoning off natural gas passing through Ukraine’s territory and heading to European consumers”. We must all get together to figure out a solution. Merkel has indicated she is taking this seriously. THE FUTURE OF UKRAINE. The Ukraine of six months ago no longer exists; it has been destroyed by the scheming of Brussels and Washington. If there is to be something on the map named “Ukraine” at the end of the year that in anyway resembles what was there six months ago, Moscow’s plan must be adopted. Autonomy for the regions so that one half can’t bully the other half; minority language rights; neutrality, neither NATO nor Russia. As to Crimea, it is part of Russia; that is done. If it offends you to call this the Moscow plan, you may call it the Kissinger plan. If these principles are not accepted, and fairly soon, then by the end of the year south and east Ukraine (known as Novorossiya – New Russia – for two centuries) will be independent or part of Russia while rump Ukraine will be in full economic collapse and even civil war (and eventual absorption by Poland?). The only thing left undetermined will be the border of Novorossiya and rump Ukraine. None of this was necessary; all of it was predictable. (Here I am in December. But I claim no special prescience: everyone who knew anything about Ukraine knew it was fatal to the project to force an all-or-nothing choice. The West did this twice: ten years ago with NATO and now with an exclusive EU trade relationship, with NATO in the background). So here we are: hard times ahead for the citizens of any conceivable future Ukraine. RUSSIA’S INVISIBLE ARMY. Much about how Russia is “massing” its army along the Ukrainian border. These reports are so confused as to be valueless – read this one carefully for example, noting contradictions; note the rag-bag elements tossed together of this one. No “massing Russian troops” were found in a 200 mile trip by Daily Telegraph reporters; nor in a 500-mile trip by NBC reporters. But it’s still hyped by NATO. (Once upon a time I believed NATO over Moscow. No more. Kosovo wounded it; Libya killed it; Ukraine has buried it. From now on my base assumption is that NATO is lying.) There is no need for “massing”: Russian troops in Crimea (already there, which is why US int couldn’t find them) were welcomed by an enormous majority and 90% of the Ukrainian forces either joined them or quit. There is every reason to expect that the reception of the Russians would be the same in Novorossiya, as we should perhaps get used to calling it. UN VOTE. A General Assembly vote saying the Crimea referendum was unlawful passed 100-11 allowing various organs to trumpet that Russia was isolated. But closer scrutiny adds 58 abstentions and 24 who didn’t vote at all to the 11: a total of 93. Given that established states strongly disapprove of secession, a 50-50 split is a sign that Russia is not isolated at all. By now many know they might be on the list for a “humanitarian intervention” and they are happy to see the West humbled in an attempt. LONGER TERM EFFECTS. I think this will prove to be pretty big; maybe even the moment when the EU and NATO will be seen to have begun their slide to oblivion. The final effects are of course contingent on many factors but some can be seen on the horizon. I think Putin (and most Russians) feel that they have been lied to by the West for the last time. (Just what did happen to the 21 February agreement, by the way?) China has taken sides in an occidental squabble for the first time I can recall. Most of the opposition groups in Russia so loved by the West are revealed to be sock puppets. All intelligent observers now know that Western N“G”Os have hostile intent (Nuland’s $5 billion). The BRICS have moved closer to becoming a political entity. NATO is further weakened (Poland would not want foreign troops stationed on it if it trusted Article 5). The EU has taken another step towards irrelevance (notice that the discussions now are Kerry-Lavrov; Ashton doesn’t exist). As a reminder, listen to Nuland’s speech in December: not at all the landslide she thought she was starting. BOSTON BOMBING. “In September 2011, Russia’s FSB sent a cable to the CIA restating their initial warning, and a second note on Tsarnaev was entered on the TECS system, but his name was misspelled ‘Tsarnayev’”. Umpteen billion dollars’ worth of NSA communications capture and storage goes for naught because the Russians have their own alphabet. Who knew? No one at State apparently. THE “PUTIN MYSTERY”. Read what he says, watch what he does, think about it (hint: the fact that people are asking who he is after 15 years shows they haven’t been paying attention). Start with the idea of patriotic Russian. As a indication, what does Putin find so funny here? the interviewer hasn’t a clue. NASA. Has severed relations with Russia. Except for the International Space Station. Which is prudent, given that Russian rockets are the only way to get there. Washington had better hope that Moscow doesn’t get really angry – Afghanistan is the other location Washington depends on Moscow to get to.